Chloe Neill has posted a teaser for the third Chicagoland Vampires novel, Twice Bitten. She has also announced that she *may* start the contest for two Twice Bitten ARCs on May 1st as well as dates for two more Twice Bitten teasers. Jacquelyn Frank has a new fabulous website. 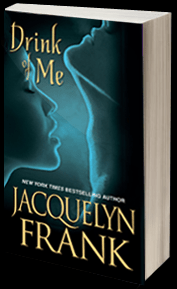 While I was browsing it, I happened to notice that Jacquelyn has two new stand alone novels coming out this year. The first one is The Bid under the pen name of Jax (which is a fabulous name in my opinion) and will be out September 28, 2010. The second one is Drink of Me, which will be out a month later on October 26,2010. The blurb for The Bid is below (as is the cover), but for Drink of Me, there isn’t much else but the cover yet. Gail Dayton, author of Heart’s Blood, by Steamed! Shackled, Vejhon can only marvel at the mysterious beauty with blue skin and shining eyes whom Najir clearly worships. But Vejhon refuses to humble himself—until Hanna’s kiss strikes him like lightning. First dominant, then sensually tender, she arouses him to explosive sexual passion that goes beyond the limits of physical pleasure. What manner of mistress has bought him and what does she want? Freedom is what he wants, but will she be worth the price? Shiloh Walker has an excerpt for her upcoming re-release (and freshly expanded), No Longer Mine. It’s amazing how the Internet can make someone forget or ignore something. For instance, I know Tez from Tez Says is from Australia, but whenever I’ve read her site, I’ve never added in an accent (which there is since I’m from the US). After seeing her lastest post, which is a Vlog on what she’s reading, that has changed. Jill Myles has posted an excerpt for My Fair Succubi over on Odd Shots. Jennifer Estep has announced the title to the first novel in a new young adult series that she’s currently working on. A Touch of Frost will focus on a young gypsy girl named Gwen Frost who has the gift of psy­chom­e­try — or the abil­ity to know an object’s his­tory just by touch­ing it. Right now, A Touch of Frost is still in the early stages, so no news on when it could be showing up in bookstores, but it’s definitely going to be one to keep an eye out for. Someone at Forbes has too much time on their hands. SciFi Wire is reporting that they’ve compiled a list of the richest fictional characters and guess who is at the top of the list. Carlisle Cullen with $35.1 billion. Seriously? Where does it say anywhere in the books how much he is worth? Michelle Rowen is giving away a signed copy of Angel with Attitude and signed copies of Charlene Teglia’s Wicked Hot and Claimed by the Wolf. Both contests end tonight at 9pm. Melissa Marr is giving away 40 different books between her blog and forum. Contest ends June 1st. Vampire Wire is giving away a copy of Ardeur: 14 Writers on the Anita Blake, Vampire Hunter Series. Contest ends April 25th. Meljean Brook is giving away a signed copy of Patricia Brigg’s Silver Borne. Contest ends April 22nd. In the spirit of the Friday Follow, I thought it would be cool to do a Book Blogger Hop to give us all bookies a chance to connect and find new blogs that we may be missing out on! So, I created this weekly BOOK PARTY where book bloggers and readers can connect to find new blogs to read, make new friends, support each other, and generally just share our love of books! It will also give blog readers a chance to find other book blogs that they may not know existed! So, grab the logo, post about the Hop on your blog, and start PARTYING!! So if you’re looking for more reading material, head on over and check it out. At last glance, there were over 100 blogs listed. I’m visiting via the blog hop. My post is here. Happy Friday. Ooohhhh, that BID by Jax aka Jaqueline Frank looks good! :) I’ll be adding that one to wish list for sure. Great finds as usual Jackie, I always look forward to your newsletters/updates. ACK! Sound on website! Bad author! No donut! JF’s site is perfect in every other way, but sound is a big no-no in my book. At least it’s not music you can’t turn off. I totally agree with you Cat! I was hoping I had provided the link that went around that. Sorry!